As the Board of Education considers changing school start and dismissal times, Anne Arundel County Public Schools continues to collect research related to this topic. See below for updated Phase II research and resources. In this National Public Radio Audio interview , Dr. Anne Wheaton, epidemiologist in the CDC's Division of Population Health, joins NPR to discuss the findings of a recent CDC study and explain why students need more sleep. An infographic highlighting the study’s findings is available here. This newscast includes CDC research as well as the practicalities of busing, after school, jobs, and childcare which all must be considered when moving school start times. This newscast includes CDC research as well as a Superintendent speaking about the 30 min change his district is making to school start times this year. This article discusses recent CDC research about high school start times across the country. Twilight is defined as the 30 minute period of 'dusk after sunset' or 'dawn before sunrise' during which the sky is partially lit. Because AACPS does not want students to be walking to or from school or a bus stop in the dark, decisions regarding changing start and dismissal times are driven by the different hours of twilight throughout the year. Click here to see the 2015-2016 Twilight Hours for AACPS. This article from U.S. News Education recognizes that new research suggests academic benefits with later high school start times, but officials say logistical issues can make a shift difficult. Elementary school start and dismissal times remained unchanged with elementary schools starting between 8:00 and 9:20. You can see the 2015-16 New Bell Schedule, Overview of School Start Times Plan, Cost References ($5.4 million) here. 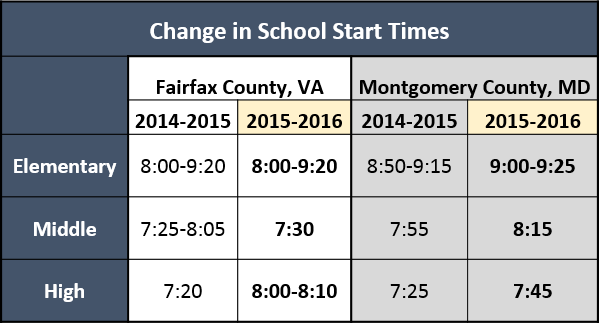 AACPS contacted Fairfax County with questions about the process of changing start times in their county. Click here to see their response. Elementary schools start between 9:00-9:25 and dismiss between 3:25-3:50. (In addition to shifting the start of elementary schools by 10 minutes, the change also lengthened the elementary school day by 10 minutes. You can see the 2015-16 New Bell Scheduld, Overview of the Bell Time Options, and other information about this change here. AACPS contacted Montgomery County with questions about the process of changing start times in their county. Click here to see their response. In August 2015, the Durham County Public Schools Board of Education voted to change high school start times to 9:00 a.m. This article discusses the benefit and impacts of this decision. In North Dakota, 78.5% of secondary schools start at or after 8:30 a.m., a higher percentage than in any other state. This article discusses the benefits and transportation considerations of this late start time. The Mid-Atlantic Regional Educational Labratory (REL) compiled a list of resources in response to a query from an AACPS Board of Education Member: Is there an academic effect on later start times for schools (elementary, middle, and high school)? What is the recommend school start time at each level? What are some of the issues that arise with later start times? Below is a summary of their responses. For the complete annoated response from REL, click here. This study examines the potential implications of early school start times for standardized test scores in public elementary schools in Kentucky.Findings support the growing body of research showing that early school start times may influence student learning but offer some of the first evidence that this influence may occur for elementary school children and depend on school characteristics. This study of school districts that have been successful in changing their bell schedules summarizes the experiences of school districts across the United States in regard to challenges faced, strategies employed, and lessons learned in the hope that this information will be a useful tool for other school districts looking to chart a course forward to promote the health, safety, and academic opportunities of their students. This study examines the relationship of sleep duration with positive attitude toward life and academic achievement and whether this relationship is mediated by increased daytime tiredness and lower self-discipline/behavioral persistence. In this study, the author uses data from Wake County, North Carolina, to examine how start times affect the performance of middle school students on standardized tests. The author finds that delaying school start times by one hour, from roughly 7:30 to 8:30, increases standardized test scores by at least 2 percentile points in math and 1 percentile point in reading. In this essay, the authors examined findings from pilot interventions in which schools delayed their start times; specifically, they examined the effects on students, including potential pitfalls and strategies to consider for effective scheduling change. There is sufficient evidence that adolescent students would benefit from delaying school start times and that this change can be implemented with tolerable consequences if adequately strategized by school districts and communities. In this discussion paper, the authors describe three organizational reforms that recent evidence suggests have the potential to increase K-12 student performance at modest costs: (1) Starting school later in the day for middle and high school students; (2) Shifting from a system with separate elementary and middle schools to one with schools that serve students in kindergarten through grade eight; (3) Managing teacher assignments with an eye toward maximizing student achievement. This study surveyed high school personnel regarding high school start times, factors influencing school start times, and decision making around school schedules.